Roger Benton, Founder and Co-Owner of RE-CO BKLYN. 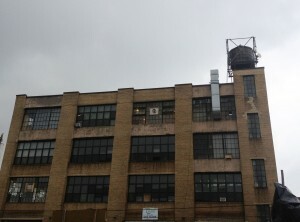 Last week we published Part 1 of my visit to RE-CO BKLYN, a Sawmill and Lumber Yard located in Brooklyn, New York. In this week’s blog we’ll get a history behind RE-CO BKLYN and its development into New York City’s only sawmill. RE-CO BKLYN came about in 2009 with “the first tree fall.” RE-CO owner, Roger Benton, received a call from a friend of his in Philadelphia, PA, saying a huge tree had just fallen in a park nearby, and that Roger should try and get it. He ended up picking it up and then he contacted the local reclaimed lumber yard, also in Brooklyn, and asked if they could slice up the tree with their vertical bandsaw. Once Roger got through the difficult task of getting the tree to Brooklyn and dropping it off at the lumberyard, they said “no way”, and left him in a predicament. He had 4 giant logs and nothing to do with them. He and his business partners ended up buying a portable sawmill, slabbed up the logs on the sidewalk next to their shop space at 3rd Ward (the arts and design collective across the street from RE-CO’s current location), and began to let them dry. To make the process faster, they built a very small kiln in the alley. 3rd Ward, Brooklyn. Across the street from RE-CO BKLYN’s current home. By the time the slabs were dry, they all went really fast, including a high demand to local woodworkers at 3rd Ward. They were originally planning to keep a few pieces for themselves, but ended up selling every last piece, and realized this was the start of something great and said “let’s try this again”, and thus was the start to a new business venture. 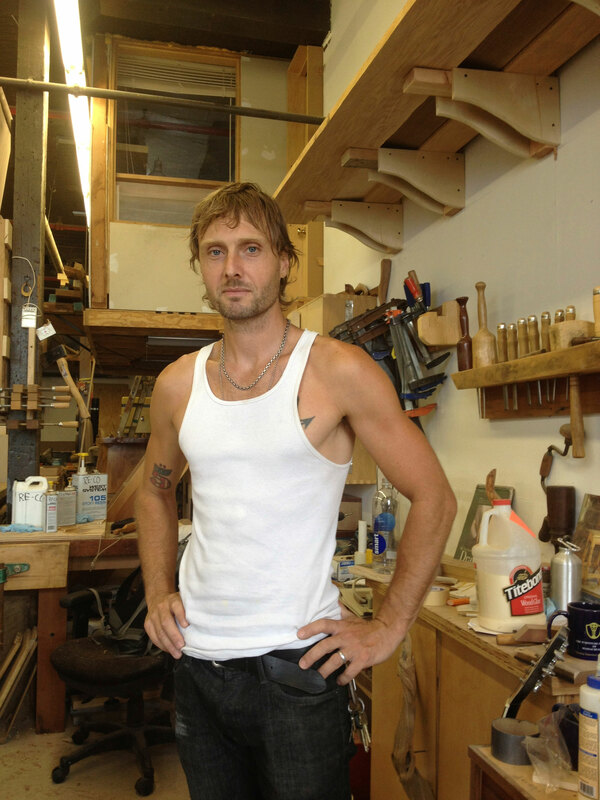 Roger knew he wanted to expand the space beyond the portable sawmill and small kiln in the alley, and got the perfect opportunity in January 2012 when he saw a guy put a sign up on the fence of the space across the street from their shop. He knew that making RE-CO into a full-time priority was going to be hard. He found a new business partner, Dan, who was also willing to go full-time with RE-CO and they began focusing on making this new space into what RE-CO BKLYN has become today. 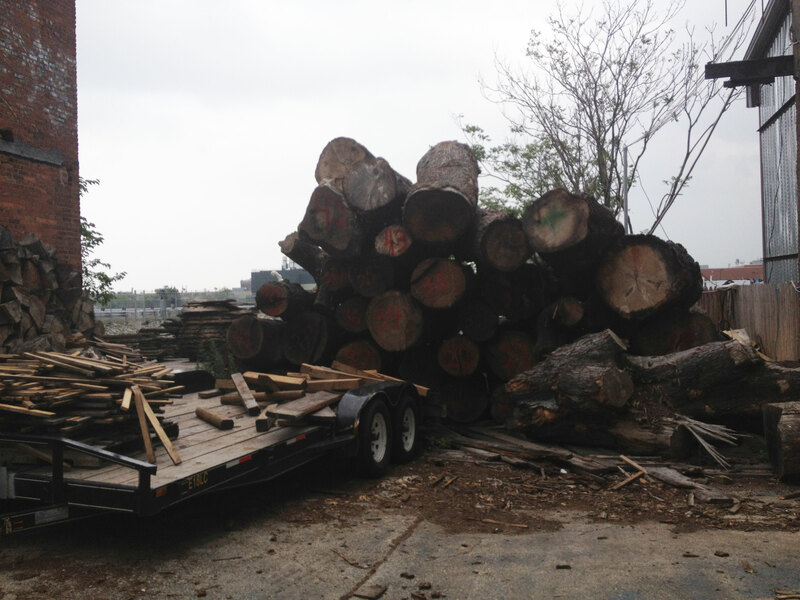 With Roger and Dan’s hard-work and dedication, they have gone from getting their first tree in Philadelphia to amassing logs from all across the Tri-State area almost every day. There are about 60 logs on the RE-CO site right now that are awaiting to be cut. In addition, they also have a pile of 60 logs currently being stored at Greenwood Cemetery, and another pile of 60 out on Long Island at a holding facility. Right now one of their main focuses is trying to get people to find more value in the wood that they see every day around them, which eventually gets diseased, removed for construction, or gets knocked down by a storm. Instead of getting chipped up into sawdust and thrown into a landfill, these logs can be milled and re-purposed for woodworking projects. It is a much more trustworthy and sustainable process versus buying lumber from a lumber yard and not even knowing the origins of that piece of wood. Some of these logs are from the aftermath of Hurricane Sandy. One example of their repurposing efforts was after Hurricane Sandy last October when the Tri-State area was hit hard, causing thousands of downed trees. Many people were aware of RE-CO and calling them up saying “if you guys can come down here, you can take as many logs as you can manage.” While they have a small trailer that can pull 2-4 logs depending on the size, Sandy presented an example where it was much more cost effective to hire out a giant container truck, which could pull in 40-60 logs, and then have them delivered and arranged in a nice pile. Many of their sources still have logs lying around from Sandy, so whenever they clear out their current stock they are able to go get more and continue making a dent in the giant pile. At the end of my visit with Roger, he took me across the street to his shop on the 4th floor of the 3rd Ward, where he has a huge shop space that he showed me around. While chatting in the shop I found out that Roger is a part of the Lie-Nielsen Show Staff along with Highland Woodworking blog contributor Curtis Turner, who recently had his own visit to the Berdoll Sawmill in Cedar Creek, TX, where they can cut slabs up to 7 feet wide! At RE-CO they can cut up to 61 inches, but try to keep it 58 at max in order to prevent the guides from hitting anything.